Streptococcus pyogenes is the leading cause of uncomplicated bacterial pharyngitis and tonsillitis commonly referred to as strep throat. 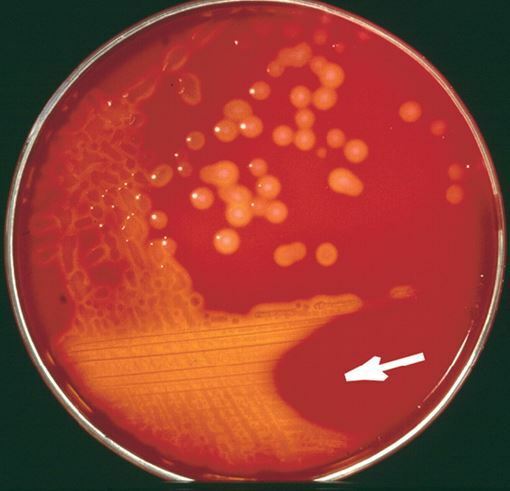 Acute diseases associated with Streptococcus pyogenes occur chiefly in the respiratory tract (sinusitis, otitis), bloodstream (sepsis, endocarditis, meningitis), or the skin (impetigo, cellulitis, necrotizing fasciitis, myositis}. Two nonsuppurative post-streptococcal sequelae, rheumatic fever and glomerulonephritis may follow 1-3 weeks after acute illness. 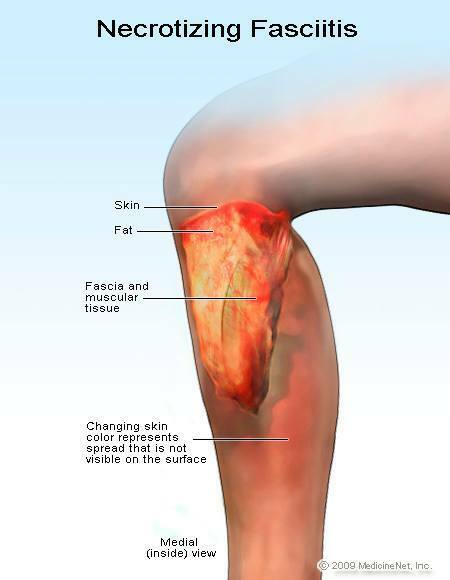 Note: S. pyogenes is also designated as “flesh-eating bacteria” because of its characteristics skin infections with involvements of deeper tissues and organs. Capsules are major virulence factors of many pathogenic bacteria as they are anti-phagocytic in nature. The hyaluronic acid capsule of S. pyogenes is non-antigenic because of its chemical similarity to host connective tissue. 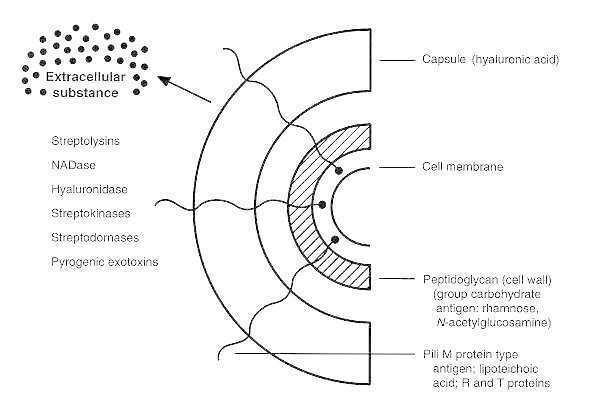 Capsule of S. pyogenes thus assists the bacterium to hide its own antigens and to go unrecognized as antigenic by its host. The hyaluronic acid capsule also prevents opsonized phagocytosis. Adhesins: Adhesion of S. pyogenes in the epithelial cells of oral, nasal cavities and skin is the first step for infection. S. pyogenes produces various adhesins; Fibronectin (Fn) binding protein, lipoteichoic acids (LTA), M protein, Protein F etc. M protein is the major virulence factor of group A beta-hemolytic streptococci. It has anti-phagocytic and anti-complement properties. It is cytotoxic for neutrophils. Streptococcal M protein mimics those of mammalian muscle and connective tissue. More than 50 types of S. pyogenes M proteins have been identified on the basis of antigenic specificity. The M proteins of lower M-types (e.g., 1, 3, 5, 6, 14, 18, 19, 24) are considered rheumatogenic since they contain antigenic epitopes related to the heart muscle, and may lead to autoimmune rheumatic carditis (rheumatic fever) following an acute pharyngeal infection. Acute glomerulonephritis can follow streptococcal infection of the pharynx (pharyngitis-associated Acute glomerulonephritis e.g., 1, 4, 12, 25) or the skin (pyoderma-associated AGN-mainly higher M types e.g., 2, 49, 55, 57, 59, 60, 61) is caused by nephritogenic strains. Hemolysins: Two hemolytic and cytolytic toxins-streptolysin O (SLO) and Streptolysin S (SLS) are produced by most strains of group A streptococci. Streptolysin O: The oxygen labile cytolysin is responsible for beta hemolysis seen around Group A streptococcus (GAS) colonies in blood agar. It is believed to be toxic to leukocytes. Streptolysin O is strongly immunogenic. The concentration of antistreptolysin O antibodies is used diagnostically as an indicator of prior or recent streptococcal infection. Streptolysin S: It is oxygen stable and non-immunogenic cytolysin. However, like streptolysin O, streptolysin S is hemolytic and cytotoxic. These toxins act as superantigens (not requiring processing by antigen presenting cells). SPEs A and C are produced when S. pyogenes is lysogenized strains (bacteria carrying an integrated phage i.e. prophage). Non-lysogenized strains are atoxic. SPE B is encoded by a bacterial chromosome. These toxins act directly on the hypothalamus to exert their pyrogenic (fever producing) properties, and they cause the rash characteristics of scarlet fever. Another disease mediated by production of potent SPE is Streptococcal toxic shock syndrome, typified by multi-system involvement that includes renal and respiratory failure, rash and diarrhea. Deoxyribonucleases (streptodornase DNase): These enzymes depolymerize free DNA present in the pus. There are four antigenically distinct nucleases (A, B, C and D), of which B is the most antigenic to humans. Streptodornases A-D possesses deoxyribonuclease activity; Streptodornases B and D possess ribonuclease activity as well. Antibody titers to DNase B are of great importance in the sero-diagnosis of pharyngeal or skin infections. Streptokinase acts on plasminogen, which is converted to plasmin, active proteolytic enzymes that lyse fibrin. Thus streptokinase appears to play a biological role in streptococcal infections by breaking down the fibrin barrier around the lesions and facilitates the spread of infection. Antistreptokinase antibodies provide retrospective evidence of streptococcal infection. Hyaluronidase: Hyaluronidase splits hyaluronic acid, an important component of connective tissue. Thus hyaluronidase aids in spreading of the microorganisms along the intercellular spaces. Other enzymes: Many strains of streptococci also produce Proteases (proteolytic degradation of host immune effector molecules eg, antibodies, complement etc), Serum Opacity Factor (SOF), Nicotinamide Adenine Dinucleotidase (NADase), ATPase, phosphatase, esterases, amylase, N-acetylglucosaminidase, neuraminidase and other enzymes which plays major role in pathogenesis.